Forget typing into a keypad or pushing buttons on a phone to make calls, access apps or play music. Thanks to the latest voice activated technology you can now do all this and more, simply by talking into a device - whether that’s a mobile phone, a computer or one of the latest digital assistants. New products are emerging all the time that will enable you to control every aspect of your home – from its heating to its lighting, and from its entertainment to its security – simply by using your voice. 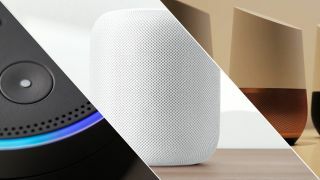 Several competing technologies now offer voice control, including Apple Siri, Google Assistant and Amazon Alexa, all of whom offer smart speakers and mobile devices that come with their AI built-in. A fourth, Microsoft Cortana, is also on the market (primarily available through Windows 10 PCs, Xbox One and the new Harman Kardon Invoke) though it remains much less popular. Launched in 2011, Apple’s Siri was the first voice activated technology to hit the streets in 2011 on iOS5 with the launch of the iPhone 4S. The following year saw search giant Google follow suit with Google Now on its range of Android 4.1 (Jellybean) phones. .... only to be replaced with Google Assistant which first launched in Spring 2016 with the Google Home. The most established of the is Amazon’s digital assistant, Alexa, which made its debut in November 2014, and has since branched out from Amazon's own hardware into a number of third-party devices like the C by GE Sol, Amazon Fire smart TVs and the Logitech Harmony Hub. Think voice control technology and the first product that springs to mind is the Amazon Echo ‘smart speaker’, or its smaller and cheaper sibling, the Echo Dot. Very similar to the Amazon Echo devices are the Google Home products, including the recently launched Google Home Max and the entry level Google Home Mini – designed to compete head on with Amazon’s Echo Dot. Currently Apple’s Siri technology is found mainly on the company’s existing iPhone, iPad, Mac and Apple TV products. However, the Cupertino-based company is planning to launch its HomePod smart speaker later this year. Increasingly Amazon and Google are licensing their voice technologies to third party manufacturers too. These include companies such as JBL, Panasonic, Harman Kardon and Sonos, for now, and likely many more in the future. When it comes to playing music, neither the Google Home products nor Amazon Echo devices are audiophile products (though you are able to output audio to your own hi-fi speaker system via Bluetooth/line output on the Amazon Echo). However, what these digital assistants lack in power and precision, they more than make up for in convenience. For example, say ‘Play David Bowie’ into one of Amazon Echo’s seven built-in microphones and it will, naturally, find free tracks from Amazon Prime (if you have it). Alternatively, you can choose music from another source, such as Spotify, or from one of hundreds available radio stations. Similarly, Google Home will find music on Google Play’s 30 million plus catalogue or from YouTube Music (if you’ve subscribed). One advantage that Amazon has over the competition is that it currently has the best far-field microphone arrays – offering up to seven microphones inside the Amazon Echo. Google Home doesn’t have as many microphones, which might make it a bit less adept at hearing you over the dull roar of a conversation, and completely outclasses Siri, which has to use your iPhone or iPad's microphone to hear what you're saying. It isn't all bad for Apple, however. One of advantage of Siri for those who are watching programmes on Apple TV is if you can’t understand what an actor has said, all you need to do is ask Siri to repeat the scene and the Apple TV will replay the content complete with subtitles. Nifty! Simply place each of the devices in a room where you want to listen to music and use the devices' respective apps to group the speakers together. With Amazon Alexa, go to Audio Groups and select Multi-Room Music within the app. It will then prompt you to create a group, so you can say “Alexa play David Bowie upstairs” instead of having to call out individual speakers. Introduced only very recently on Amazon Alexa, the multi-room feature is currently available for Amazon Music, TuneIn, iHeartRadio, and Pandora with Spotify support coming soon. Google Home, which has offered multi-room support for longer, already supports Spotify. In addition to music, digital assistants are increasingly being used for home automation, too. Again, Amazon is leading the way, given the head start on its competitors – but Apple's HomeKit program has really started to gain traction among developers, and Google's complementary hardware suite includes devices from Nest like the Nest Learning Thermostat. What does voice control do? One example is that you can use your voice to dim your home’s Philips Hue lights, adjust the temperature via Hive or Nest digital heating system or ‘arm’ your Blink video security system when you go out. Since opening up the platform to developers in 2015, Amazon has been able to grow the number of ‘Skills’ (like apps but specifically for voice control) which Alexa offers to over 10,000 – a fairly large number, everything considered. Google is still playing catch up with approximately 70 third party manufacturers providing voice activated smart home devices and an expanding number of ‘Actions’ (Google’s equivalent of Amazon’s Skills) available in its store. Although Apple’s Siri is very much a closed system, in-car - where voice control is particularly useful - it has made some headway. Currently around 200 models including Audi, BMW, VW and Ford cars offer Siri via the firm's CarPlay software. Of course, what's the point of an AI if it's not a know-it-all? Want to check the weather forecast? Or maybe you just want to find a bit of trivia or simply hear a joke. Digital assistants can be really useful (not to mention good fun), especially if you have got your hands full in the kitchen making dinner. Ask Siri to tell a joke and most likely it will tell you ‘Google, get Siri-ous. Ha, Ha.’ But the truth is that of the three main voice technology platforms Google Home probably has the most developed ‘brain’ thanks to its integration with Google’s search engine. Google Home can understand context much better than Amazon Echo so, for example, if you don’t know the name of the Eminem song but you know that it features Rihanna, it should still find the track ‘Love the Way You Lie’. Similarly, if you ask a question about where was Adele born and then follow up with ‘tell me how many Grammys has she won?’ Google Home will know you are still talking about Adele. Over the last few months, digital assistants have also been adding functionality to make the routine things in our lives a little simpler. For example, both Google Home and now Amazon Alexa can be used to set voice reminders and check events in your calendar. They’ve also both added multiple user support so the devices can be taught to distinguish the voices of different family members (all you have to do is speak various phrases into the app so it can identify your voice). They can then provide personalised information, such as calendar appointments, traffic and news sources, based on your profile. Another recently added feature, at least for smart speakers, is text messaging and voice calling – a novel idea that Siri has been offering for some time. The latest assistants are even able to tell the difference between callers, so if you say ‘Call Mum’ they know it’s your Mum and not say your Mum’s Mum. With Alexa, once you’ve synched your contacts in the Alexa app you just ask it to place a call. If you’ve registered your number in the Alexa app, your contacts will see that number and know that it’s you. In the US and Canada, Google Home can even be used to make calls to any number (mobile or landline) free of charge although it can’t receive calls. Undoubtedly, digital assistants are getting more sophisticated. And while they’re still mostly used for playing music or asking for information, they are increasingly being used to help make our lives easier - either through home automation or support with routine tasks. Of the three assistant technologies currently on the market Amazon’s Alexa remains the most advanced with products like the Echo Dot being a particularly good value for those looking to dip their toes into the smart home space. However, Google is fast catching up and next year we predict major advances from the search giant. As for Siri, it seems that Apple – once the pioneer of voice activated technology – has now dropped to the back of the pack.